Set of 4 Storage bags ; Laundry bag, Shoe bag, Bikini bag and Lingerie bag. Made in Cotton canvas with attractive embroided logo on them. Drawstring closer. Our organization is engaged in manufacturing & supplying high quality array of Cloth Laundry Bag. 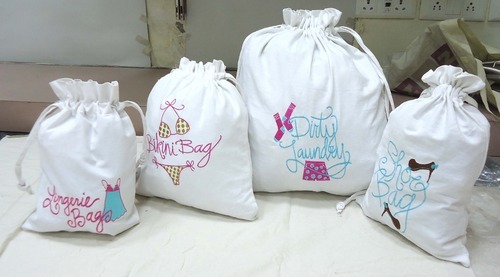 These Laundry Bags are ideal for keeping soiled clothes to be given for laundry in the hotel industry, home etc. Our range is available in various colors and easy to carry designs. These bags come with a drawstring closure for enabling easy handling and safe storage of the clothes. With the support of our adroit team of designers & craftsmen, we are manufacturing and exporting a comprehensive array of excellent quality Cotton Printed Laundry Bag with Wooden Stand. The offered assortment of laundry bags is manufactured by our experts in adherence with the international quality standards. Further, as per their choice & preference, our customers can avail these laundry bags in various designs, colors and sizes. Bagmaker is one of the leading organizations engaged in offering Storage Organizers, Printed Motifs Hanging, Collapsible Hamper, Star Print Collapsible Hamper, Eva Hamper, Back Pack, Wooden Hamper & Accessories designed to enhance Home Fashions. We make sure that we offer storage organizer, storage accessories, home storage accessories with finest quality goods & create innovative products as per the preference of global buyers. Skilled designers who understand home fashion trends and market specific requirements. Today, storage organizers and accessories offer a perfect way of expressing home fashion. Therefore we endeavor to develop products that are in vogue and at par with trends. We have incorporated latest technology and imported machines to ensure that the storages and accessories are finely stitched with seamless finish & look. Moreover, the raw material we use, including thread, textile, fabric and accessories are pre-inspected at vendor’s end before procurement to assure quality. All these gave us noticeable presence in the domestic arena and also in countries such as USA, Europe, Germany and Australia.